We just learned today that Ricka (formerly know as T2) passed away yesterday. She died from acute liver failure due to an infection. She was one of the star hens (the Giant Chicken) in our Mad City Chickens documentary. Ricka lived with us in our backyard for 6 months during the production of the film. She answered to the name T2 back then and was always such a gentle and friendly bird. Near the end of filming, she went with her sister, Red (now known as Flicka) to live with a loving family who were new to backyard chickens in Madison. 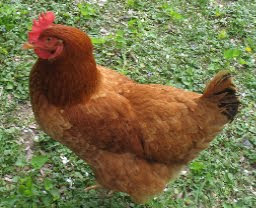 T2 was a Red Star, a breed which is known for its friendly nature as well as its large brown eggs. Not only did T2 become the poster child for our film–people don’t forget a giant chicken running through the city–but she also made it onto public television when she and her sister did an appearance with us on the show Director’s Cut. We will always have such fond memories of Ricka. She touched so many people’s lives (and will continue to do so through the film). She will be missed.